Slow Cooked Beef Massaman Curry - Rich, fall-apart beef in a spicy homemade sauce with new potatoes. Perfect comfort food! Heat the oil in a large pan. Toss the chopped beef in the cornflour, salt and pepper. Fry the meat in the oil for about 5 mins on medium to high heat. You can do this in batches, but I'm a bit too lazy for that. I find that if you put the meat in, and leave it alone for a few minutes before you stir it, you'll get a nice dark colour on the beef. The beef will probably stick a bit to the pan, so you might need to give it a little scrape with a spatula. Once the beef has cooked for 5 mins, turn down the heat a little and add in the spice paste you made earlier. Give it a stir to coat the beef and let it cook for a couple of minutes. Then add in the beef stock and coconut milk. Give everything a stir (make sure you give any bits stuck at the bottom of the pan a scrape), place the lid on and gently simmer on a low heat for 1 hour 45 mins (alternatively you can place in the oven at about 160C/320F). Give it a stir every so often. If it's starting to look dry you can add in some more beef stock or water. After the 1 hour 45 mins, add in the potatoes, give it a stir and cook for a further 25 - 30 mins until the potatoes are tender (this is a good time to start cooking your rice too). Take out of the oven and mix in the lime juice. Serve the curry on a bed of rice with a sprinkling of coriander/cilantro, fresh chillies and a wedge of lime. 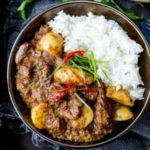 Can I make Massaman Curry Gluten Free? Also check you're using gluten free fish sauce, shrimp paste and coconut milk. Can I freeze Massaman Curry? Yes, any leftovers of this curry can be cooled, covered and frozen. Then defrosted and reheated in the microwave until piping hot. Can I use a shop bought paste instead of making my own? Yes - although shop bought pastes are usually stronger. So use about 4tbsp instead of the 6tsp of homemade paste. Also check it's a gluten free brand if needed! Nutritional information is per serving, not including rice.